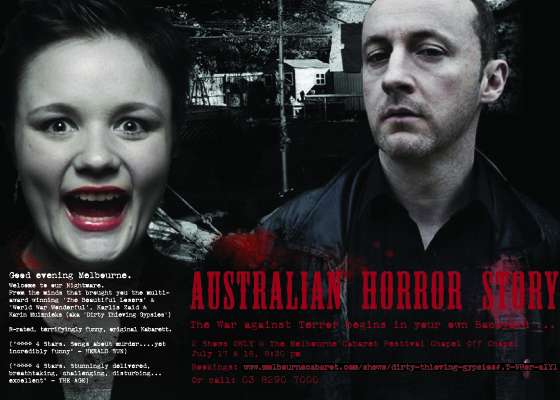 Filthy Secrets was created by Karin Muiznieks and Karlis Zaid for inclusion in the 2012 Melbourne Cabaret Festival. The War Against Terror begins in our own backyard. Beautifully melodic tales of sickening, blood-curdling and hilarious deeds from the stucco and shopping malls of the six hundred and sixty-sixth layer of Hell: Australian suburbia. Starring Karin Muiznieks and Karlis Zaid. Karin Muiznieks is an award-winning composer and performer whose many credits include writing the scores and performing in: ‘World War Wonderful’, ‘Filthy Secrets’ (“**** 4 stars. Songs about murder … yet incredible funny” – Herald Sun) and ‘Give My Regards To Broady’. She has received two Green Room Award nominations for songwriting, and ‘World War Wonderful’ won Most Popular Show at the 2009 Melbourne International Comedy Festival. Later this year, ‘WWW’ will premiere at the Edinburgh Fringe Festival. Karlis Zaid created the ‘cabaret terrorists’ known as The Beautiful Losers (“**** 4 stars. Stunningly delivered, breathtaking, challenging, disturbing … excellent” – The Age), who toured extensively, winning Green Room Awards and a Melbourne Fringe Festival award. In recent times, he also appeared alongside the great (actor and philanthropist) Geoffrey Rush in MTC’s ‘The Drowsy Chaperone’.